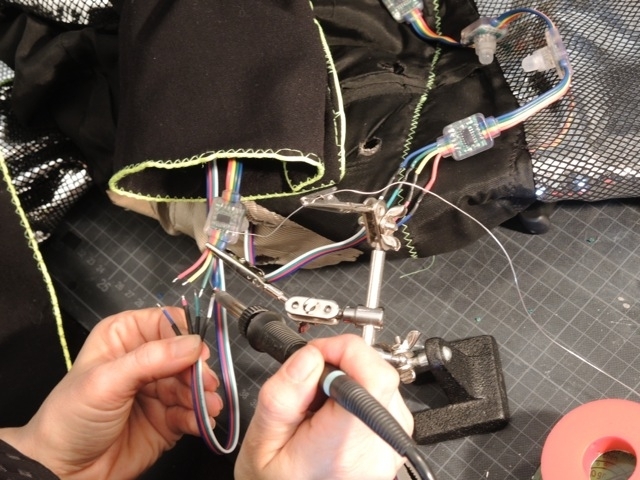 This Tux Is All Light #WearableWednesday « Adafruit Industries – Makers, hackers, artists, designers and engineers! I remember meeting Anya Hübschle in Berlin. She came up to me after a wearables talk all excited about the idea of programming LEDs. She was already using lights in her costumes, but custom designs were really what she was after. 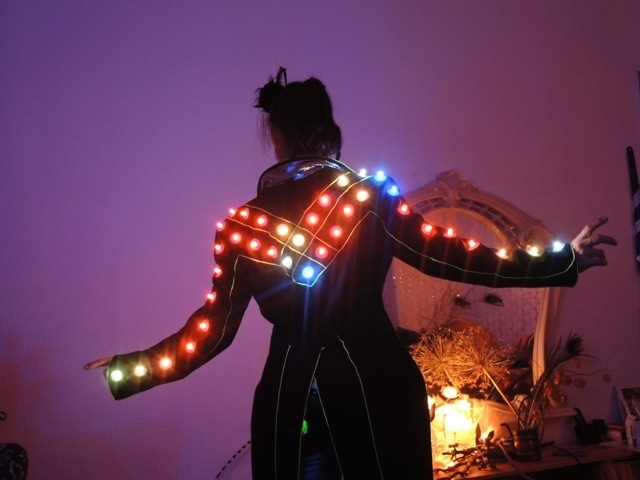 Fast forward, she recently attended an LED jacket workshop by Trafo Pop, and created a glorious tux jacket! She and her brother do theatrical performances with their company In Love with Fire and recently launched the new costume at a Gatsby party. 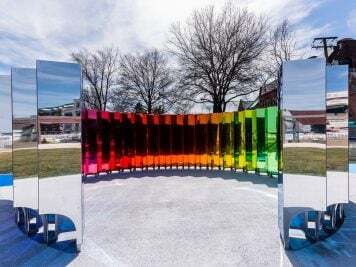 I was fascinated by the look of these special pixel LEDs and the possibility to program each and every one of the 60 LEDs according to the needs of the act! We wanted some programmed LED costumes for the entrance scene in our LED show-act “Pretty Lights”, and it had to be an E-textile for many kinds of performances or promotions, like showing the corporate colors of a brand. I looked for a classy outfit that would fit into many different events. 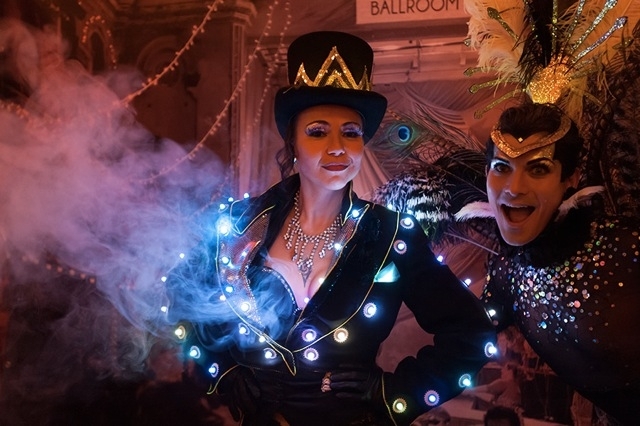 The costume starts with a long tailed tux jacket and is hacked with individually addressable LEDs and an Arduino Nano compatible board. Notice the trim that has been hand sewn with a zig-zag stitch along the cuff? It’s UV reactive trim that has the look of EL wire without the batteries. Love that! Another interesting feature is the use of iron-on foil, which Anya lasercut into star shapes. 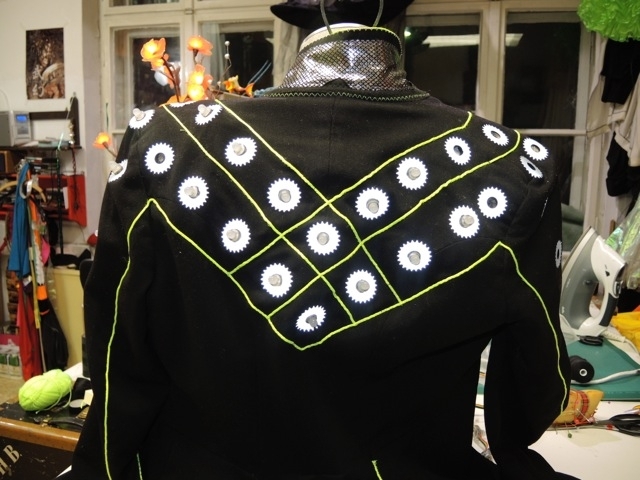 I wanted the tailcoat to look different when the light comes from outside towards the coat (then it’s reflective) to when the lights come from the LEDs. Trafo Pop provides you with lasercut plastic rings that you iron on the inside of your jacket. They hold the LEDs in place, but I decided to iron them on the outside, and so the decoration is also a disguise for them. Both the foil and UV trim create linear patterns on the jacket that emphasize movement and really grab attention. Plus, the stud look of the LEDs creates more of a playful look than the sleek LED stips we’ve become accustomed to. I think Cirque du Soleil really should be talking to this duo about costumes. 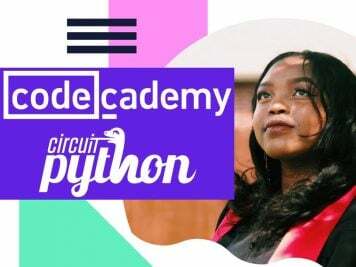 There’s nothing more exciting than witnessing someone grow in their craft, and I’m really so delighted that Anya has chosen to take the next step in soft circuits. Now she’s on the path to understanding programming. Now I just need to learn the program that Trafo Pop developed. I want to have sunrises on my back that change colors and trickle over my shoulders. I’m sure we’ll be seeing that costume in the future. 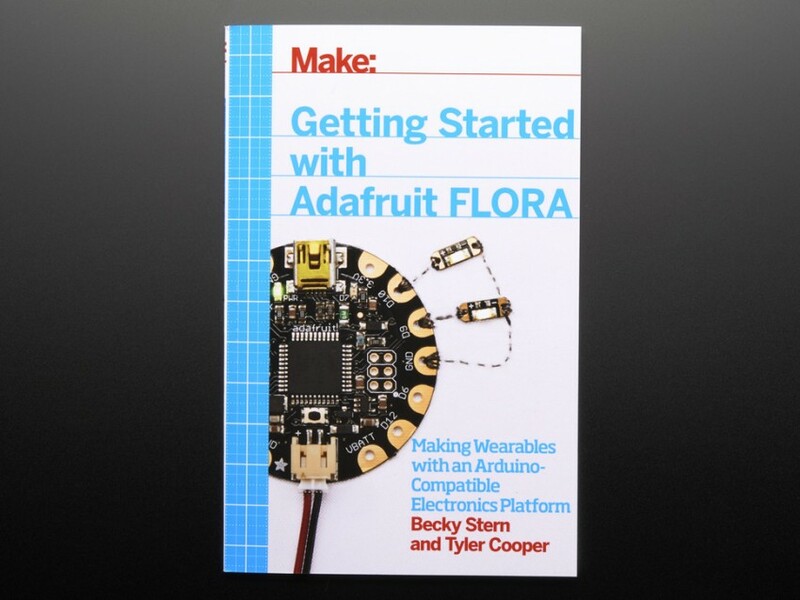 For those of you who want to make a costume with custom lights, a first good step would be to check out our new book Getting Started with Adafruit FLORA. 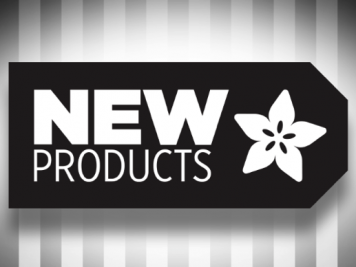 You’ll find great info and color photos outlining tools for getting started, as well as sewing techniques and projects. So, start sketching that costume design.